I really never expected New Zealand to have this much, for such a small country. 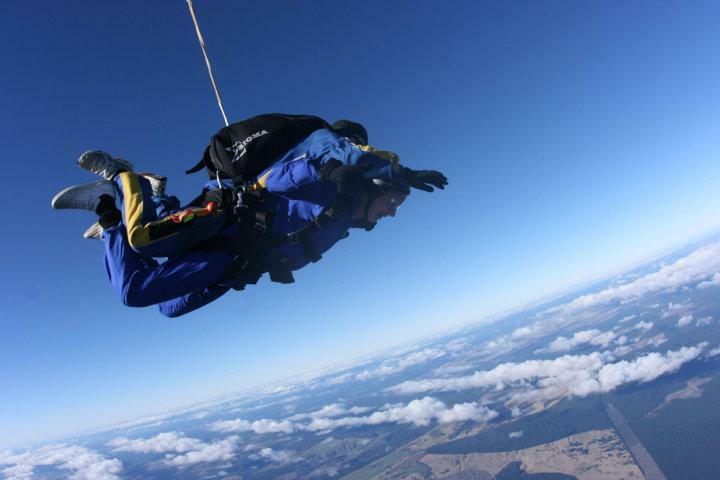 Today I went for skydiving over Lake Taupo, the biggest lake in New Zealand, and my god was it wonderful. Could find something cheaper, but f***, went on impulse. And it was totally worth the money! Not quite as scary as the bungy, but damn if it wasn't at least as wonderfull. Doing a tandem like I did means you just act as a deadweight and the guy you're stuck to takes care of everything. This removes a LOT of the pressure, you don't need to worry, just hang back and relax. The first few seconds are, however, terrifying. Just as you say on the edge of the plane and realized what was about to happen, something clicked in you saying "This ain't really right..."
The next second you were spinning towards the ground. After the first shock of not having something under you, everything was just really cool. Spinning around, trying to watch the ground and the camera dude. After about a minute the guy on my back pulled the cord and the chute opened up. Suddenly it was totally quite and the camera man soared past for a while before he pulled the cord. To spice things up a bit, the man on my back, hereby known as chute-dude, went around in circles, pulled the chute til we were basically lying flat on our sides and spinning at a furious pace. But when the chute was out, it was nice and quite anyways so you basically just enjoyed the gorgeous scenery that is Tongariro national park and lake Taupo. The snow covered peak of mount doom (Mount Ngauruhoe) in the far distance with the sun glistening in the huge body of water beneath you... I'm in love. Now to the important part, something I thought a lot about: what is better, skydive or bungy? And which should you do of the two? Totally different, is my answer to the first question and both to the second one. Bungy IS, as almost anyone agrees, a lot scarier and an insane thrill. Skydiving is not the legs-shaking-mega-scare that bungy is. It is however an experience on a completely different level. The time you spend free falling gives you a lot more feeling of freedom. Spinning around with the chute is also funny as hell. Gun to my head, I would have to choose the bungy. Just the sensation of diving out head first straight into a very real ground is like nothing else. That being said however, skydiving hasn't been awarded a fair chance since I just did a tandem and not a "real" jump. But if just on a regular tourist trip, like me, DO NOT MISS NEVIS BUNGY! Hubblebubbel är ett sjukt namn på tuggummi.